(1) Model CSC-50 semi-automatic cartoning machine (carton folding→filling→packing) It is specially design to pack small quantity of diverse packaging. (2) With low cost and it only require small area. It is suitable for various sizes of carton. 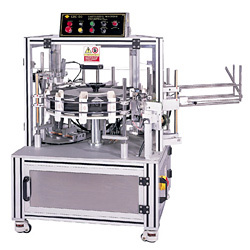 The machine is a vertical type with multiple functions and requires a short time to change parts. (3) The machine is made of aluminum alloy with anode treatment. (4) Rust proof long lasting life cycle and clean. 2. Suitable usage: medicine, foodstuff, cosmetic, etc. packing into square carton. 1. Paper box’s smallest carton size: 60 x 20 x 20m/m. 2. Paper box’s largest carton size: 200 x 80 x 80m/m. 3. Production speed: 20-50 cartons per min. (according to operator’s performing speed). 4. Power supply: 220V; 50/60HZ, single phase. 5. Motor horsepower: 1/4HP AC motor. 7. Machine measurement: L 1400 x W 1200 x H 1140m/m. 8. Machine weight: 350 kg.